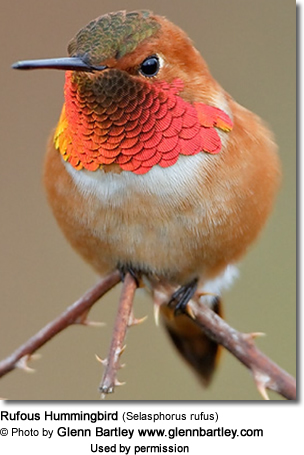 The Rufous Hummingbird (Selasphorus rufus) - or Red-backed Hummingbird - is a relatively common, small, migratory hummingbird, with the longest migration route of any hummingbirds that occur in the United States - potentially traveling over 2,000 miles from Alaska to southern Mexico and back, and crossing mountain ranges as high as 12,600 feet. In fact, they make the longest bird migration on earth, as measured in body lengths. 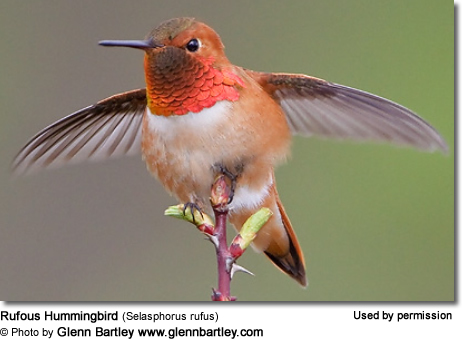 It is one of the most widespread hummingbirds in North America that has been observed in every state and province except Hawaii, Prince Edward Island and Quebec. One isolated report exists even from extreme eastern Siberia. These birds breed in open areas, parks and along forest edges in northwestern United States, through western Canada, up to southern Alaska south to northern California, east to Nevada, Colorado, Montana and Idaho. They have also been recorded in Arkansas, Alabama, Delaware, District of Columbia / Washington, D.C, Mississippi, Missouri, Connecticut, Georgia, Idaho, Illinois and Florida. 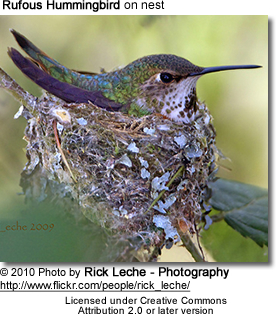 They nest further north than any other hummingbird and are able to tolerate temperatures down to at least -20°C or -4° Fahrenheit. In July and August, many migrate through the Rocky Mountains where nectar-rich flowers are blooming, and nearby lowlands to take advantage of the wildflower season there. If they find a spot they like, they may stick around for a long time, in which case they often aggressively take over and defend their feeding locations. There has been a trend for them to migrate east to winter in the eastern United States, for example Florida. Some even travel as far south as the Turks and Caicos Islands - a Caribbean island group. They typically live in forested and brushy areas, and along forest edges. They winter in mountain meadows, oak-pine forests at middle to high elevations, as well as in brush and scrubland areas. They also visit gardens, particularly those with hummingbird feeders. 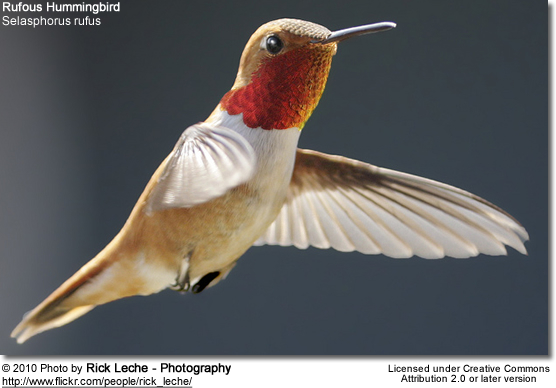 These birds are typically solitary; and can be quite aggressive, tirelessly chasing away other hummingbirds, even outside their territory - in places they are visiting during their migration. Their existence is threatened by habitat conversion and fragmentation along their migratory corridors. As of 2011, its global population is estimated to be around 6.5 million. The North American Breeding Survey suggests a possible decline of 1 to 2 percent per year in Oregon, Washington and British Columbia. They have an excellent memory for location, enabling them to easily find their favorite feeding flowers from day to day and even from year to year, as they migrate between their breeding and wintering territory. It has been observed that many of them will return to their favorite garden feeders every year. 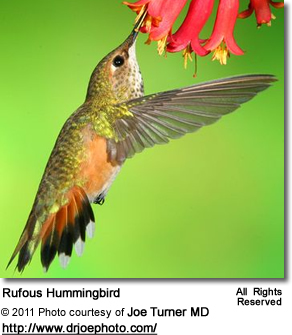 The Ruby-throated Hummingbirds and the Rufous Hummingbirds are amongst the most likely hummingbirds to show up at garden feeders in the eastern United States. 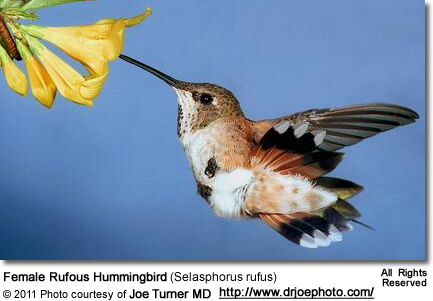 These hummingbirds primarily feed on nectar taken from a variety of brightly colored, scented small flowers of trees, herbs, shrubs and epiphytes. They favor flowers with the highest sugar content (often red-colored and tubular-shaped) and seek out, and aggressively protect, those areas containing flowers with high energy nectar. They use their long, extendible, straw-like tongues to retrieve the nectar while hovering with their tails cocked upward as they are licking at the nectar up to 13 times per second. Sometimes they may be seen hanging on the flower while feeding. They will drink sap from holes created by sapsuckers and may also visit local hummingbird feeders. They also take some small spiders and insects, such as wasps, flies, ants and beetles - important sources of protein particularly needed during the breeding season to ensure the proper development of their young. Insects are often caught in flight (hawking); are snatched off leaves or branches, or are taken from spider webs. The male will mate with several females. His courtship display consists of him flying in the air and then diving towards the female but pulling up just before he reaches her. During his aerial display, the male's wings beat at a rate of 200 beats per second and make a distinctive humming sound. The average clutch consists of two white eggs, which she incubates alone for 12-14 days, while the male is very territorial and defends his territory and the flowers he feeds on - even fighting off other males in mid-air, or chasing away larger birds and small rodents. The female alone protects and feeds the chicks with regurgitated food (mostly insects since nectar is an insufficient source of protein for the growing chicks). 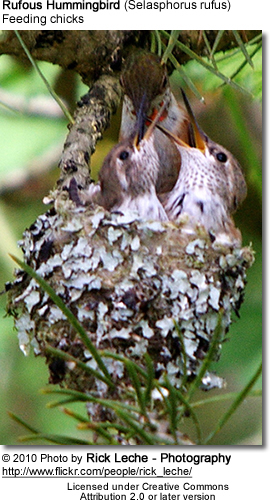 As is the case with other hummingbird species, the chicks are brooded only the first week or two, and left alone even on cooler nights after about 12 days - probably due to the small nest size. The chicks leave the nest when they are about 7 - 10 days old. These birds are typically silent, but occasionally musical chip and repeated buzzy chattering can be heard.